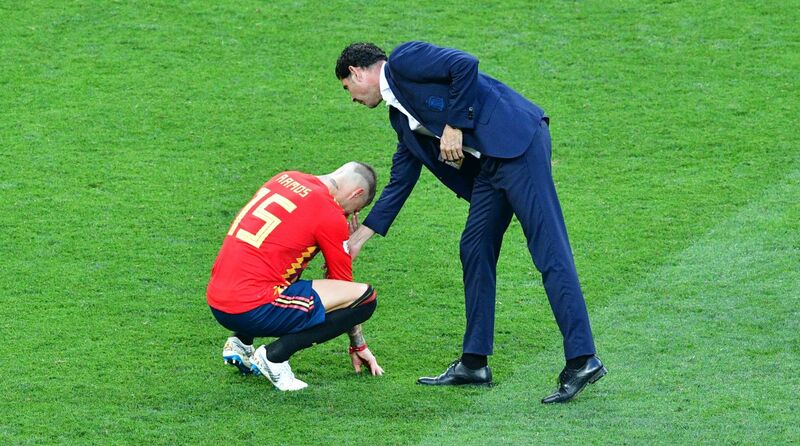 Spain coach Fernando Hierro said it was not the right time to contemplate his future after his team crashed out to World Cup hosts Russia on penalties in the last 16. Koke and Iago Aspas saw their spot-kicks saved by Igor Akinfeev as Russia prevailed 4-3 in a shootout following a 1-1 draw in Moscow. Hierro was drafted in as coach on the eve of the tournament when Julen Lopetegui was sacked after it was announced he would take over the Real Madrid job next season. “That doesn’t not worry me, I don’t think it’s something for right now,” said Hierro when asked about his future in the role. Hierro rejected any suggestion the team would have fared better had the Spanish federation not decided to axe Lopetegui after arriving in Russia. “We had opportunities to win this match but we ended up in a penalty shootout which is basically a lottery, and we weren’t lucky,” he said. “I don’t think you can talk about the team breaking down or there being any sort of collapse,” the former Real Madrid captain said. “In football there’s a fine line between winning and losing.” Spain have not lost over 90 minutes since they were knocked out by Italy in the last 16 at the European Championship in France. However, they won just one of four games in Russia after Hierro took over the reins. Luis Rubiales, the head of the Spanish FA, said the federation was going to wait “a few weeks” before coming to a decision on Hierro’s position. “I must thank Hierro and his team for their dedication, and in a few weeks we will get back to work,” Rubiales said.